Bisato Mosaic, a photo by Lara604 on Flickr. 1. crudo of hamachi, 2. Bisato Dining area, 3. salumi of the day (reminded me of the Portuguese sausage my babysitter used to make), 4. homemade folded pasta with octopus puttanesca (Don't let this one scare you, it was divine! Deep flavors and octopus cooked to perfection), 5. seared lamb chops with whipped potato (these chops had this beautiful caramelized crust, and of course the potato was the creamiest ever! ), 6. homemade sausage (I don't think I've ever had sausage quite this tasty!) 7. orange confit with chocolate caramel mousse (you really do have to try this simply for it's unique flavor and preparation), 8. dark chocolate wafers with pistachio cream (probably one of the best desserts I've ever had in my life!). There is one photo missing, and that was the homemade pasta sheet with truffle butter sauce...heavenly and sinful, even if it looked really quite plain. So I could write paragraphs and paragraphs describing this place to you, or I could keep it short and sweet and just say that if you have to try ANY fine dining place where the chefs know what they're doing in Belltown, Seattle, then you have to come to Bisato. Wildly creative chef Scott Carsberg and his entire staff, can create the ultimate dining experience for you with plenty of culinary knowledge, a very pleasant atmosphere, and leaving you completely satisfied and wondering how many times you can afford to eat here every year because it was such unforgettable food. The bites are albeit small, so you have to order at least 2-3 items each and expect to be enticed by their artisan cocktails and/or scrumptious wine list. What I'm saying is, just be prepared to spend some dough here. Yes I know, I know, you can buy the most delicious street food just around the corner for under 8 dollars, but this is simply a different journey that you prepare yourself for...a road where your taste buds might land on something you have never tried before, or prepared in a way that you wouldn't expect! 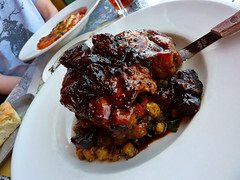 Bisato played with my palette on so many levels, every mouthful I found myself groaning. Just see the photos above...they pretty much tell the story right there. I'm not even sure I could describe exactly what I tasted and could only say that you have to go here at least once! Come for a special anniversary, come to simply spoil yourself, but whatever the reason, just go! To grill a bat, or not to grill a bat? An interesting culinary find article I thought I would share! I think I can remember Andrew Zimmern eating a bat, but I think it probably takes some practice to cook it properly. 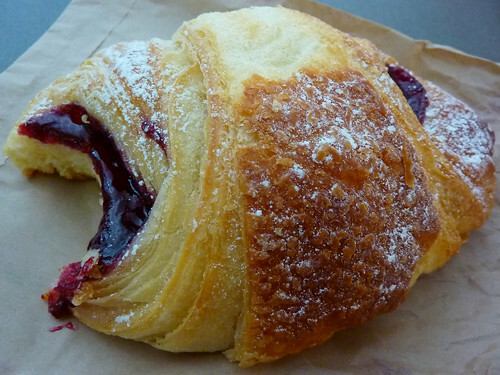 I've blogged about Boulangerie Nantaise before HERE, but this morning I had a mondo sized marionberry croissant that I had to pass visually on to you. Can't you just picture your piehole around this flaky, sweet, decadent pastry?! Oh gawd, I was in heaven. Even if you couldn't care less about Charlie Sheen as an actor or as a screw up in the news, this is still pretty funny. Just as someone who loves food, I found this extremely amusing. If you need the back story on why he was in the news so much lately, click HERE. Watching/reading a bit of that will probably make this video more rewarding to watch as well. Vegan Chocolate Cherry Crème Cupcakes! I'm so glad I finally tried making these this past weekend. Straight from the "Vegan Cupcakes Take Over The World" recipe book, I only altered it a wee bit by using one of these pans to create the holes needed to pour in the cherry mixture as well as not having shaved chocolate to add on top at the end. There are a few steps for this recipe and are a little labor intensive, but totally worth it. I used Remlinger Farms frozen whole cherries for the recipe, but I think they recommend some sort of dark cherry variety. Turned out just fine though with a lovely tart zing to them and just enough sweetness! 1. Beat the shortening and margarine together until well combined and fluffy. Add the sugar and beat for about 3 more minutes. Add the vanilla and soy milk, beat for another 5 to 7 minutes until fluffy. The Cherry Sauce that you will be filling the cupcakes with! 1. In a saucepan over medium heat, combine thawed cherries and their juice, and sugar. Stir until mixture starts to simmer, about 4 to 5 minutes. Whisk together arrowroot and pomegranate juice in a small bowl or cup, then steadily pour into the cherries, stirring constantly. Keep stirring; the mixture will rapidly thicken. Remove from heat and allow to fully cool to room temperature. If you don't have that type of pan that makes holes in the middle of cupcakes, just with a measuring tablespoon carefully dig out neat cones in the middle of each cooled cupcake. 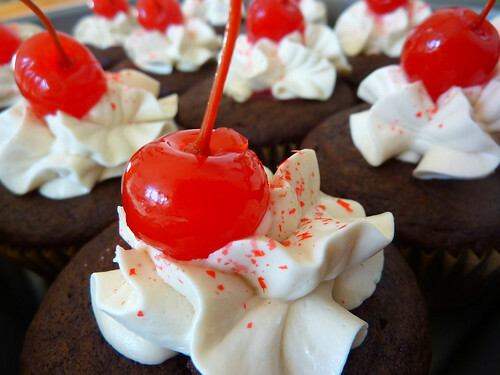 Spoon about 2 to 3 cherries plus sauce into each hole and pipe a nice frosting star onto each cupcake. 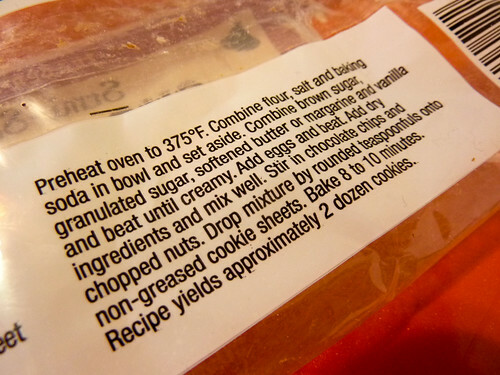 Add sprinkles or shaved chocolate and top with a cherry! If you end up doing the version the book suggests, save the little pieces from the cake holes and layer frosting, then cake, then frosting, and finally shaved chocolate and a cherry on top. Voila! Tower of cherry chocolate ready to be devoured! Sally Rowe's documentary on Paul Liebrandt, A Matter of Taste. I guess I'll have to watch this! It will be on HBO sometime this summer. Looks like the classic story of great chef on the roller coaster ride that is the Culinary World. I have always had thoughts about entering it, but it's films like these that will probably keep me from doing something so intense...even if it is incredibly rewarding at the end. Seems like you have to be a special sort of person to make it. 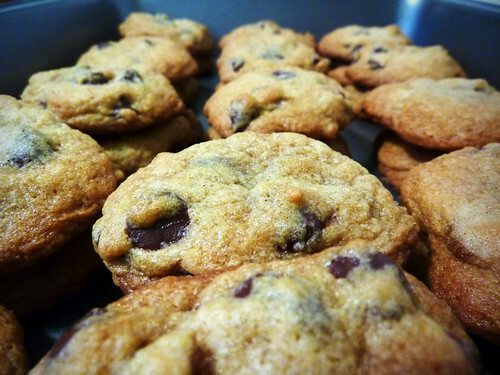 Another great chocolate chip cookie recipe! 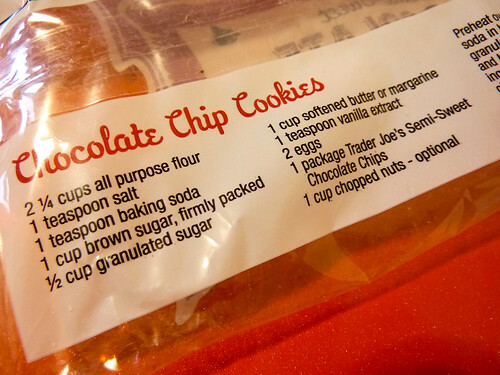 This one I got from the back of a Trader Joe's package of Semi-Sweet Chocolate Chips! I probably ate about 5 cookies worth of batter, but this package made more than the 2 dozen it suggested. I used a teaspoon to drop the dough on the sheet pan and cooked them for 8.5 minutes at 375 degrees. We finally got a new oven so the temperature is what I put it to and I am no longer running an excessively hot oven! It's like heaven I tell ya. Anyway these cookies were a huge hit at work, on the softer side with a slight crunch from the chocolate chip. Of course a minute out of the oven they were into my mouth and ooey gooey awesome. I found the chocolate pretty tasty too! 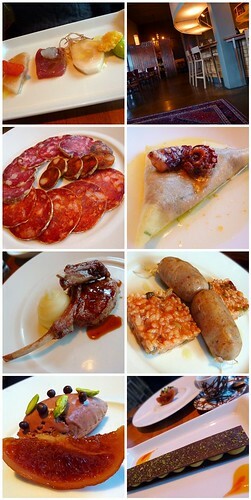 Top 50 things that Foodie's should do! Now, realistically looking at this list, one cannot possibly expect to do them all but I think it would be fun to at least try or do something close! I think my first order of business is to chop up a whole chicken...yes yes...must do that soon. Where are my medallions of chicken with grill marks?! Seriously, even Kashi or Ethnic Gourmet looks more like what's in the package. And the taste certainly didn't make up for lack of appeal. I might be compelled to write to these people I was so taken aback at how awful it was. For the same price, which was about $6.50 (expensive for a frozen dish I'd say!) I could have had a nice soup and sandwich at the deli next door to my work, or even a full meal! Gah! I've had to pack my lunches lately to save money for some upcoming vacations, and thought I would buy a couple of frozen entrees to save time. 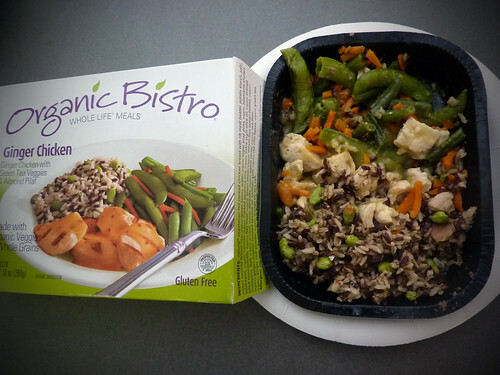 It usually is "okay", but these Organic Bistro ones were practically inedible. The beans were wrinkled to oblivion, the chicken was dry, and the rice was completely tasteless. Okay, it was all pretty tasteless. Look at how sad those beans are, wishing they could be pushed overboard and taken the dying chicken pieces with them. Pineapple Brulee Belgian Waffle a photo by faji_tama on Flickr. Finally had a chance to try Sweet Iron Waffles on 3rd Avenue in downtown Seattle this past Sunday. I was meeting a dear old friend and got caught up in mouthfuls of delicious waffles and lovely conversation that I forgot to take a photo! So I am using this one I found on Flickr which does absolute justice in capturing how warm, fluffy, crispy, and mouth watering these babies are! I had one of their specials, the Blueberry with Lemon Curd, on a plain waffle (tasted like a blueberry lemon muffin! ), while my friends had 2 chocolate covered waffles; one with STRAWBERRY AND WHIPPED CREME, while the other had the BANANA BRÛLÉE. There is really nothing like the banana one, I must say. Peering over at the next table I saw someone eating theirs with bacon, brie and basil and that looked amazing too. They have their waffle making down to a science here, brûlée-ing the bananas quickly with a blow torch, and their mise en place ready to top the delicious cakes. Also the batter appeared to be pre-measured and shaped into rounds so that all they had to do was throw them onto the waffle iron and not spend a bunch of time making a mess up front. Downside: The place is small, so be prepared to stand and eat if you have to. We were lucky enough to snag the last seats. I wish the place didn't look like a chain, because their waffles sure had that house-made feel to them. I also highly recommend getting an extra waffle to share with friends or for yourself, as they run a little small for my taste. Next time you find yourself in the Seattle downtown core during breakfast hours, you need to try this place out!